Nowadays 3D printing technologies are used in different areas such as aerospace engineering, architecture, design and etc. But one of the most important spheres that really cares everyone is medicine. In medicine, 3D printing technologies had most success with dental work, hearing aids but it is also being developed and revolutionized joint replacements. Let’s remember poor duck Dudley who could walk again thanks to the new 3D printed limb. Now similar technologies have also applied to humans. A story of Martin Mayers, who had two meniscus tears several years ago and it got so bad that he could not even walk one block without stopping, can give a hope to many others who struggle with the same symptoms. Martin desperately needed a new knee and thanks to 3D printing he got a new type of knee implant that was made using 3D printer. Mayers was one of the first patients in the US who got such knee. 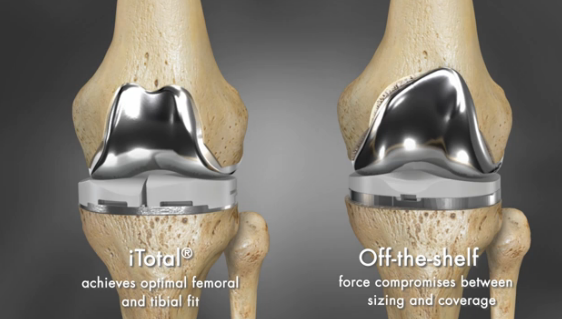 A company called Conformis printed out the 3D knee which is more precise and more natural compared to the traditional one. The company uses a special patented technology “iFit ConforMIS”. It allows converting CT data into implants that are precisely sized and shaped to conform to the unique 3D structure of your joint. Then its special Jig instrumentation uses the same data to create cutting and placement guides that help surgeon determine the exact placement of patient’s implant. This reduces surgical time and minimizes the amount of bone cutting required. As for Martin Meyers, he spent six weeks recovering and is now back on the golf course, swinging without pain. “I don’t feel like I have anything in there,” he said.